Obligatory Spoiler Warning: I will be discussing the events of the Avengers episode in the post. If, for some reason, you’re interested in the show and this blog and have not seen the show, go and do that first. The blog will make much more sense, and you won’t have your enjoyment of the show spoiled. You Have Been Warned. Narrative Framing: Several narrative tricks are used in this episode: Kang (from the future) is studying the events of the past. We start of with newsreel footage, which is an additional level of framing around the origin of Captain America, followed by seeing Cap in action with Bucky and the Howling Commandos in WWII. The RPG question all this narration raises is: How much of it is “visible” from the players’ perspective? In other words, are the players “inside” the story, and therefore not privy to foreshadowing or other narrative framing elements like Kang’s presence in this episode (which none of the Avenger “player characters” witness) or are the characters inside the story, but the players have more of an “outside” view? I’ve tended to use the latter approach in my own games, occasionally running foreshadowing scenes or other framing inserts for my players that give them certain information about what’s going on or waiting in the wings, trusting that they can separate their knowledge of such things from the actions and decision-making of their characters. However, I can see how that approach wouldn’t work for some groups. “Nobody Wants to Hear Your Boring F’ing Origin Story…” Speaking of narrative framing, this is the first Avengers episode with a true “origin story” in it. The Iron Man, Thor, and Hulk episodes pretty much assume you know who these guys are and where they came from (or at least you don’t particularly care). This one tells you exactly who Captain America is and what happened to him, setting things up for a later episode. So, the question here is, how does this origin story and setup get played out, and when? Is it a “prelude” to the regular game sessions (to use the Storyteller term) or part of a played-out character creation session? A flashback played when the Avengers find Cap in the modern era to explain how he got there? Or would it not translate into RPG terms at all, just being “backstory” written down on Cap’s character sheet or shared in brief summary text? The Logan/Wolverine cameo with the Howling Commandos is a nice touch. Minions of HYDRA: Cap and Jack Fury plow through the HYDRA troops en route to the castle. Again, either a minion rule in play or HYDRA agents are low-level enough that guys like Cap can eat ‘em for breakfast without even breaking stride. The one HYDRA guard gets the drop on Cap, but Bucky drops the drawbridge on him! Presumably, the HYDRA guard is crushed to death, but it happens “off-screen” and is immediately glossed over. Interesting to note that Bucky seems the more bloodthirsty of the duo. One wonders if part of the scene is to reinforce the idea that this is war. Sidekicks: Bucky, archetypal comic book sidekick, raises the question: What is he in game terms to Cap? One of Captain America’s game traits, and therefore an extension of his character? Or an independent character in his own right? Certainly, in this initial scene, Bucky serves as an advantage for Cap, providing a timely last-minute save. Was that the player’s choice or the gamemaster’s? How are sidekicks best managed as a resource? Cap and Bucky trade-off well in fighting the cyclops in terms of one attacking while the other is defending/distracting their opponent. Could this be an application of two characters effectively fighting as one in terms of sidekick management? “Even if you survive, your partner would not.” Six HYDRA agents get the drop on Cap and Bucky and they surrender, in spite having plowed through two or three times that number to get to this point. Getting RPG players to surrender in such circumstances can be difficult, since “surrender = defeat” for many, rather than just being part of the genre. Should there be a game mechanic to enforce this element? Is it the threat of the HYDRA agents having the advantage or is the Red Skull (and therefore the GM) invoking Cap’s “sidekick” trait to enforce his surrender; he’s got to “pay” for the advantage of Bucky sometime. “Now? Not yet…” Similarly, how does this interaction between the eager Bucky and the cautious Captain play out? 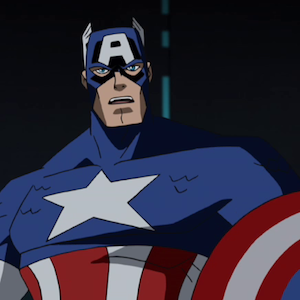 How does Cap’s player know when the moment is right to act and put a stop to what the Skull and HYDRA are doing? Is the blinding flash from the dimensional bridge an opening presented by the GM or created by the player(s)? Similarly, the missed HYDRA attacks that damage the dimensional bridge machinery: GM or player influence on the narrative? Master vs. Minions: Nicely illustrated by how Bucky takes down a half-dozen HYDRA agents while Cap punches the Red Skull and knocks him down, but doesn’t take him out of the fight at all in about the same amount of time. Bucky spends a lot of time dodging Strucker’s sword attacks (he evades about a half dozen swings and thrusts) while taunting him before finally setting him up to stab into the machinery and electrocute himself. What’s the in-game reward behind this sequence? Is Bucky at a sufficient disadvantage (unarmed vs. sword-wielder) that his player chooses this course of action—defending and taunting—as tactically sound, or is it just more fun to play it that way? How many “rounds” or game turns does this sequence consist of? Strucker swings several times, Bucky taunts at least twice. It could be anywhere from a single game turn with a lot of description to played out over several, although the question then becomes what is Cap doing during all this time? Cap stuns three of the mythic creatures with his shield before using flaming fuel to keep them all at bay. Bucky is ultimately the one to shut down the dimensional bridge, suggesting that he’s either an independent character or a “part” of Captain America’s character, and under his player’s control. Otherwise, it seems rather like scene stealing on the GM’s part. Kudos to the show for making Bucky’s sacrifice feel meaningful. How would this play out in game terms? This is a pretty major event, part of Cap’s modern motivations and a potentially significant change in his traits (assuming Bucky is one of them). Of course, if this is a prelude, then Bucky was only a temporary trait at best, present for this story and then gone. Does the GM decide to sacrifice Bucky or does Cap’s player do so? Or was it “predestined” in that it was already an agreed upon part of Cap’s backstory, just being played out? Geek Aside: Note the Egyptian stylings to Kang’s command chair and such. A nice nod to his “Rama Tut” persona in the comics. Speaking of backstory, the whole rest of the episode, with Kang studying Captain America’s disappearance and dealing with the temporal rift, falls under the whole question of Narrative Framing, mentioned at the start of this episode. Should players be privy to this information? Is there a point where the GM should treat them as “audience” rather than “participants”? What does this episode teach us about superhero game design? Give Players a Reason: Ideally a game system should merge the options of “tactically sound” and “narratively interesting” since, when the two are in conflict, players often go for “tactically sound” since it’s the option that lets them win and keep playing (where as “tactically unsound but narratively interesting” tends to equal “losing”). This isn’t always true; some players will make the tactically unsound choice in the name of good roleplaying, but they shouldn’t necessarily have to do so. After all, we want our RPGs to be narratively interesting, right? A number of games incentivize these choices with rewards: “approved actions” in Torg awarded bonus Drama Deck cards for taking a variety of tacks in combat. Complications in Mutants & Masterminds award hero points for making sometimes unsound decisions that are in-character. Aspects and stunts in FATE work to make narrative options tactically useful as well and many powers in D&D 4e are designed to give players a wider range of options in encounters than “I attack” each round. Equal and Opposite Actions: Thinking further about the concept of Equal Actions discussed previously, I wonder if it is more in the sense of Equal and Opposite Actions, that is, it’s not like each side gets an equal number of completely independent actions, it seems more that when the sides interact, they each get to do something, regardless of how many things each character gets to do. So, if six HYDRA agents attack Captain America, Cap gets six counter-attacks which, given his fighting skills, probably means six hits for him, six misses for them, and six unconscious HYDRA goons. Likewise, if four heroes attack the master villain, he gets four chances to react to their attacks. This is a somewhat different approach from the traditional mode where there is an actor (rollinging the dice and/or generating a result) and an acted upon, who is usually passive (providing a difficulty or target number in some fashion). Instead, both characters are acting with the possibility of one succeeding (or maybe both failing or reaching stalemate). This entry was posted in Game Design, Re:Animated and tagged avengers, design, reanimated, rpg, superhero. Bookmark the permalink.